I'm in love with Butterick 5147.... seriously - I want at least a half-dozen of these dresses that's how in love I am with this pattern. Fair warning the word love(ing) may be used several times throughout this post, probably as many times, if not more than T.iger used E.lin's name during his apology speech. Also, I love this plaid against the deep brown boucle fabric and thought it appropriate to again try my hand at matching plaids. After wearing my houndstooth plaid dress and feeling all svelte and loving the look, I knew I had to repeat this pattern without a hiccup, belch or kink. I initially planned to use a taupe pinstripe poly/cotton, but when my guy mentioned that he liked the way I looked in the other dress I immediately dove into working up this plaid without coming up for air. 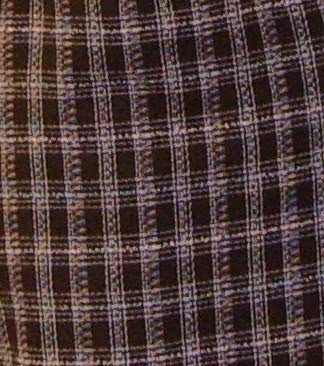 I used the same technique for matching the plaid that I'd used for the first one... love that technique, and hand basted the seams to check fitting. There would be no foolery with my machine this time around no siree Bob. Faye recommended this video tutorial for the zipper application and like her, must have watched it 20 times and it worked like a charm. I love the zipper technique and it wll become a must do for zipper application. Honestly, I think this is the best zipper I've ever done. Thank You Faye! The dress is fully lined and it was a must with boucle fabric. I love boucle, and have a few rtw boucle garments, but I've had issues with the seams fraying. I serged and did a double stitch to ensure I wouldn't end up with fraying seams, at times while at work I find myself doing aerobic moves to get things done and that's by any means necessary. Did I mention that I am in love with this notice-me plaid too, which I find fun, girlish, with a touch of the unexpected - yes I said girlish despite nearing the 50 bend...lol. I feel that this plaid dress does just as great a job of adding refinement and power to my wardrobe as a suit..... well not as great... but almost... did I say how much I love this pattern. With all that said I feel like doing the riverdance.... lol. Very cute!!! I love that plaid. As to jumper vs. sheath...I have always called it a jumper when it has a shirt under it. Of course, someone else might have an answer more based in reality and fashion history than that!!! I really love your dresses too! They look great on you and the fabric choices are perfect. If I were you I'd work it til it just won't work no more! Very cute! Love the plaid! Sheila, you look fabulous. I haven't worked with plaids in a very long time but you inspire me. I love your sheath/jumper. I have this pattern too! Darling, darling sheath dress. The plaid is wonderful as is your matching the seams. Graet job. Looks great! Dresses worn over a blouse, I call a jumper. It looks great that way. You look fabulous in that dress / jumper! Very cute! You look great. Quick note - the fabric is from Joann's sale table $6.00/yd. I purchased iridescent poly/rayon fabric this past weekend in increments of 2 yds each in navy blue, burgandy and rose colors. I have earmarked the N. Blue for another B5147 dress and the others for skirts. Love the plaid! Your dress looks great on you.. Very nice cut! You look beautiful in this dress! I think it's a very cute sheath/jumper. I would call it a jumper if you wore a blouse under it too. I love this one also.. I like that you shortened the hemline it looks really good on you...by the way thanks for sharing that invisible zip tutorial. I immediately saved it to my blog for future reference.. lol.. Yet another lovely dress.. I see why you love this style dress/jumper (I don't think I've ever used the word jumper! ), they look great on you! Nice job at matching plaids.. something I've never done! Both dresses are lovely. Your matching skill is great. I also have this pattern in my stash but I never thought of using a plaid. Keep them coming. Sheila you look so good. I like that jumper. It looks like a classic to me, but I grew up in the '60s! You did it again!. Fabuloussssss. Make another one, in fact make a few. Love it! Hey Sheila, you look so cute in your "sheath". LOL! This pattern works with you very well! @ opal: yes you are correct - I did cut the dress shorter than the first one and think it works better with my 5'3" frame. Beautiful dress and only someone stuck in the 70's would say "jumper" lol. Oh cute !!! So nice that you can wear a plaid. I hate to think of how a plaid would make my tummy look. This is a very scary thought. As to jumpers versus sheaths. You can look at it in a few ways. I am middle aged and was brought up saying that children/youngsters wore jumpers while women wore sheaths. -- Also, jumpers are the type of dress that you would wear a shirt or turtleneck under while sheaths had nothing underneath. Or (and this is my last explanation) jumpers were considered more casual (for work or school) while sheaths were worn in church (with a sweater, jacket or shawl) You would wear a sheath to dinner, any dressy or after-five function. Only the unsophisticated would confuse a sheath with a jumper. and this is all I'll say on that subject. Isn't it wonderful when you find the right style and everything falls into place?!!! I think you look great too! Great dress! I just wandered over here following Carolyn's musing on how angry she is with you for your great use of this pattern, and now I see why. Wow, this looks wonderful.